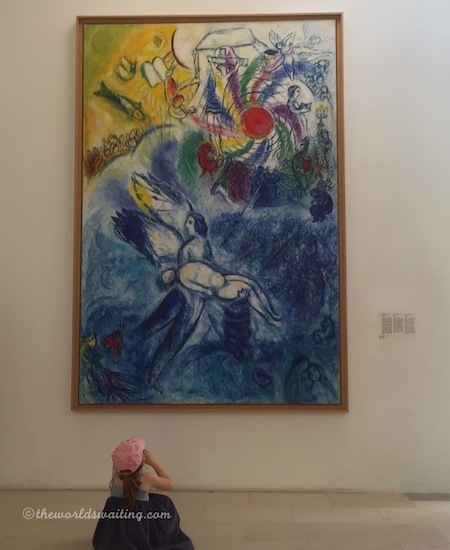 If you’re a fan of Chagall’s colourful and dreamlike compositions, the Chagall Museum in Nice is a must-see. Nestled in the hillside neighbourhood of Cimiez, high above the city, the unassuming museum is a haven of tranquillity, housing a host of treasures. The French Riviera has been a source of inspiration for innumerable artists. While many visited the Cote d’Azur, Marc Chagall was one of the artists that called the region home. 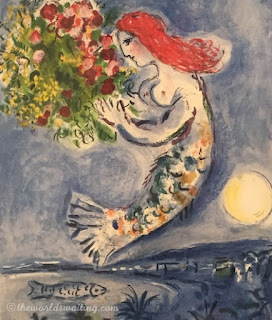 Chagall first visited Nice in 1926 but, having had to leave Europe and relocate to the USA to survive the Second World War, he only lived in Provence from 1950 to 1966. Opened in 1973, the museum was created, with the artist’s help, to house his most important biblical works: 17 paintings depicting the stories of the Old Testament. Chagall gifted these to the French state in 1966. They are displayed in the main gallery of the museum, and an audio guide is available to guide visitors through the images. 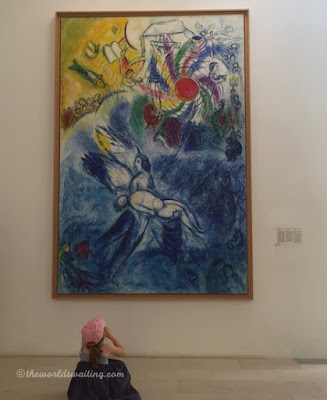 While I do not consider myself a very religious person, it is clear that religion was important to Chagall and his interpretations of the Bible stories, and his representation of them is fascinating to see. There are also several other works to see including other paintings, mosaics, stained glass windows, tapestries and sculptures. As someone who loves Nice, something I especially enjoyed seeing was the temporary exhibit showing lithographs of paintings completed by Chagall to promote Nice. In the early 1960s, Nice Mayor Jean Medecin asked Chagall to create a promotional poster for the city. The final poster depicted a mermaid with a shock of red hair, holding a bright bunch of flowers, and floating in the air high above Nice (shown above). Chagall created several preparatory gouaches that were since turned into lithographs, and these are on display this summer (2015). In the dreamlike style of much of Chagall’s later work, this series depicts couples and mermaids floating over the buildings lining the Promenade des Anglais. The images are very colourful and feature a lot of flowers, in a nod to Nice’s vibrant flower market, and the annual Battle of Flowers. A film about Chagall’s life and work also plays in both English and French (at different times). The museum is open 10:00 – 18:00 during summer and closes at 17:00 during winter. It is sometimes closed for a few weeks at a time during winter, so it is worth checking before you visit. Adult entry is 8 Euros, but admission is free on the first Sunday of each month.